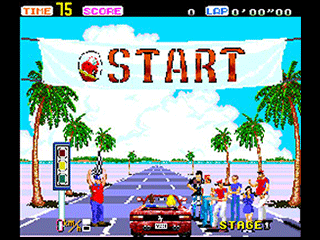 Outrun was created by the game developer/producer Yu Suzuki who joined Sega in 1983. I’ve read that Suzuki was inspired to create Outrun because he was a big fan of a 80’s movie The Cannonball Run which is a movie about an illegal across America car race with entrants who will do anything to win including playing dirty tricks on other competitors. 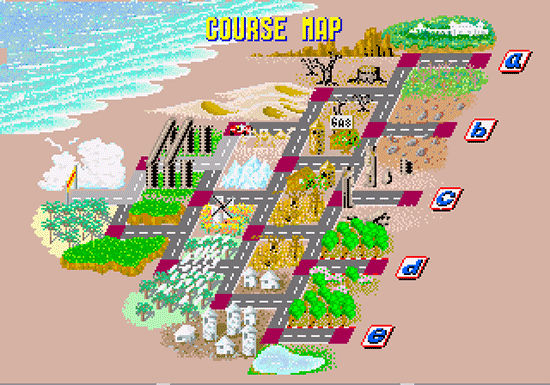 However, regardless of this influence, it is known that the various stages in this game are not designed from American roadways, but are instead based off European highways found in France, Germany, Switzerland and Italy. 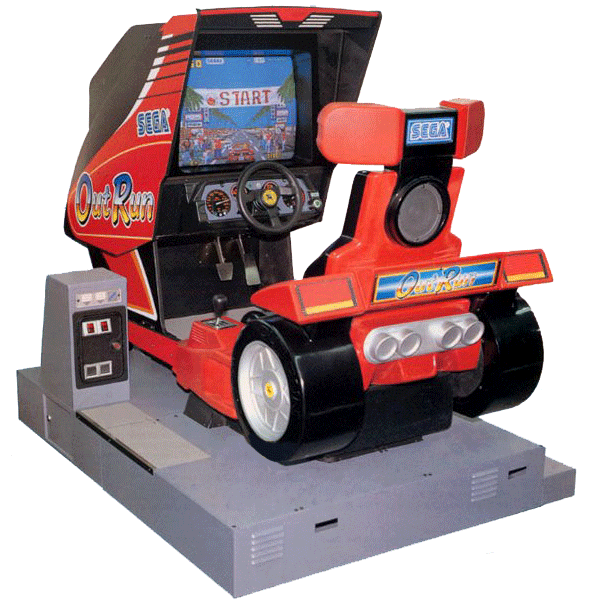 The arcade version of Outrun was released in 1986 and was the first driving game that I can recall that offered a ‘force-feedback’ self-centering style steering wheel and a ‘deluxe’ sit-in cabinet with hydraulics. The only other game which offered a hydraulic cabinet at the time was Space Harrier — a sci-fi rails shooter that Suzuki was involved with as well — also released by Sega. The ‘deluxe’ cabinet moved based on your steering direction, as well as tilting up or down depending upon the way the road flowed. Outrun was also offered in 3 other arcade variations including upright cabinets and a ‘standard’ cabinet with no hydraulics. The car driven throughout this game is a beautiful red convertible Ferrari Testarossa which is capable of a top speed of just under 295km/h. Your character is a male driver and seated beside you is a blonde haired woman. Your goal in this driving game is to drive well enough through the traffic while staying on the road and to reach the checkpoint at the end of the stage before the initial 75 second timer expires. Each time you reach a checkpoint, your timer extends and this allows you to continue playing on into the next stage. I believe some versions have adjusted the initial time to 80 seconds (via DIP switches) to make it somewhat easier to complete at least the first stage for first time players. Just before the checkpoint at the end of the stage, you will reach a fork in the road. Choosing the left road results in a slightly easier stage than if you choose the more challenging right road. The game is over when you either run out of time or if you successfully complete five stages and reach a goal — and this is not as easy as it may sound. Each time you hit a car or a piece of scenery, you will lose time — and if done at high speed, your car may flip causing you to waste a decent amount of time. My preferred route to travel is to take the Right fork into Devil’s Canyon then the Left fork into Snowy Alps, followed by the Right fork into the Wheat Field and then finally the Right fork into the Autobahn — all going well then finishing at Goal D.
The deluxe hydraulic cabinet and the usage of a ‘force-feedback’ self-centering style steering wheel felt quite responsive and realistic. The games usage of gradients in the sky to show different times of day — and how smoothly the sky and scenery transforms when you enter each new stage. 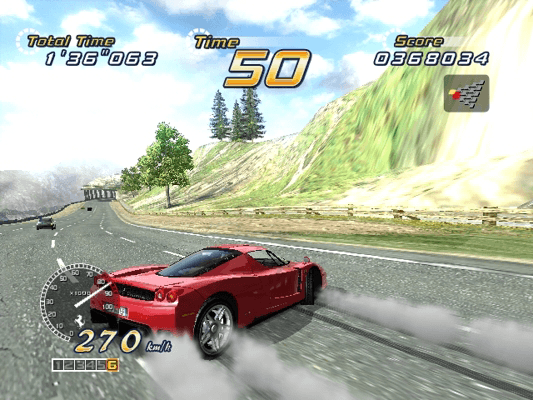 The game view being different to many arcade racing games at the time, almost like the ‘chase mode’ view you see in another Sega game Afterburner where the camera’s perspective is located behind the rear of the vehicle. Due to this camera view, you are not permitted to reverse or turn around the car. It was the first game where you could select your choice of background music via a simulated radio. My favorite ‘station’ is called Magical Sound Shower, but there is also Passing Breeze and Splash Wave available to choose from. It was the first non-linear time limited driving game ever to hit the arcades — giving you various routes to reach one of the five goals. Yu Suzuki — the legendary game designer who has been the producer/director of many other great games from Sega including Space Harrier, Hang-On, Virtua Fighter and Ferrari F355 Challenge. 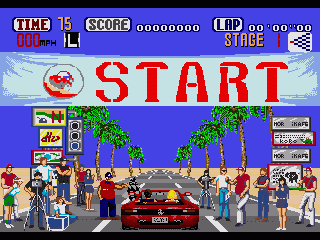 With the arcade version of Outrun being a major success, Sega quickly ported the game to the Sega Master System. Considering this port was required to run on a console with major hardware differences compared to the arcade board, the Master System port was great! A companion music cassette with the Outrun games tunes was include with the ZX Spectrum port rather than having in-game music. The fork in the road and most of the scenery was removed from the Commodore 64 version — but this sacrifice gave us a faster and playable game. The CPC Amstrad version struggled to provide a smooth driving game and was quite unplayable due to the slow and stuttering nature of the game. I often wondered why there was no Sharp x68000 port of Outrun — given how fantastic the Space Harrier and Hang-On ports are on that system — but I have since discovered this port was canceled due to issues at the time. The Atari ST version feels like it is a port of a port — the ZX Spectrum version to be precise — and while the graphics have been updated a bit, to me personally this version was a MAJOR disappointment. The speed of the game was slow and stuttered and the music sounds like it’s gone through a phazer guitar pedal. The Commodore Amiga version feels like a port of the Atari ST port — making it even worse than the Atari’s port — and the intro to the Amiga version is truly bizarre — Out Un Un Un! The PC DOS version is quite playable but like many ports, removes aspects of the game. The car is very low to the ground in this version though. The Sega Saturn conversion of Outrun I believe is an accurate port but I have not personally played this yet so I can’t give an opinion on this port. This is the best home console version of Outrun from the 1980’s and 1990’s. It is a faithful conversion, with great graphics and most importantly, keeps the feel and speed of the arcade version. A few things were missing from the scenery like the ocean in Stage 1, but I’d rather the faster game and this is the best you will get in 8 or 16 bits. 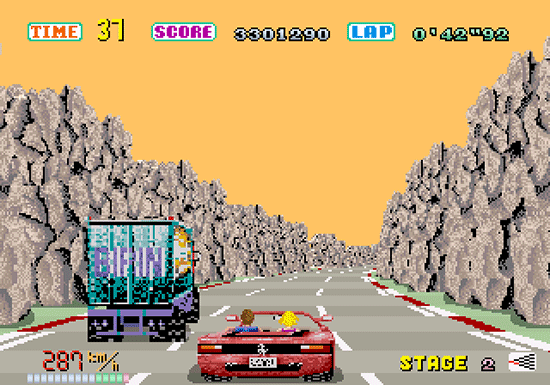 Outrun certainly seems to be an example of when an 8-bit version of a game outshines most of the 16-bit ports. This is probably controversial being placed above the MegaDrive version but I personally preferred it. 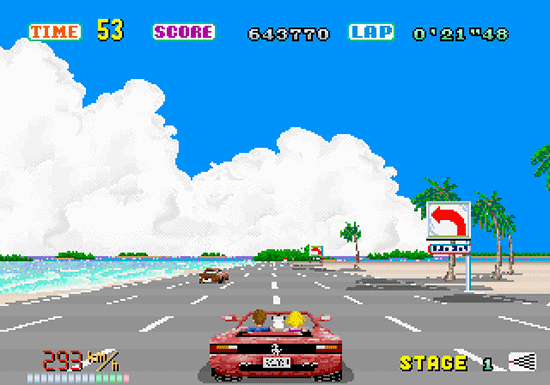 It might have been because of the speed of this game and because it was the first Outrun conversion released. It is a fluid game and the controls are really responsive. The sound effects were not the best and the music was ok — typical of 8 bit musical beeps, and at times, there are no cars on the road but yours — but overall this is a decent 8-bit conversion. One of the better 16-bit ports, but I still seem to prefer the version on the previous generations console. I think the road feels a little bit smaller on this version and with more traffic on the roads, this can make it quite hard to manoeuvre through at times without crashing. 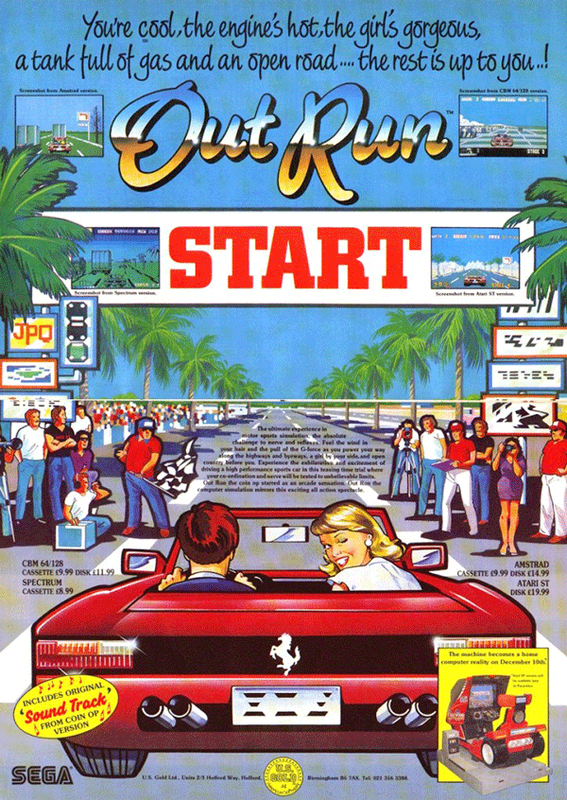 With some nice sounds and music that is good (though sometimes I think there is a whining cat sound used), this version of Outrun is a favorite of many retrogamers. As previously mentioned, you don’t get the forks in the road and your route is fixed — so the C64 version of Outrun gives you 5 different versions of the game to load — one for each of the possible endings. This version of the game is a decent port with a fast game speed and controls that respond reasonably well. It is nowhere near as colourful as some of the other ports due to it’s colour palette restrictions, but it’s a fairly good conversion that always seems to have cars in your way! 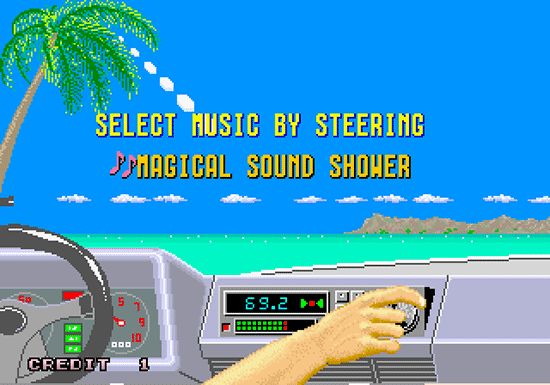 I definately prefer the music of the Commodore 64 version but the tire skid sound is quite annoying. What could be better than Outrun? Outrun 2 of course! 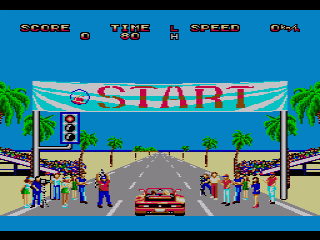 Outrun 2 improves upon the original Outrun formula by offering 15 revised stages and more cars to choose from — 8 cars on the arcade version and 12 cars on the console version. The game now has 7 background music songs to choose from including the original 3 remade and 4 new ones. The game further adds a drift feature where you can really slide the cars almost unrealistically sideways around the corners while maintaining your speed. Outrun 2 also added 2 new game modes to the original Outrun Race mode. 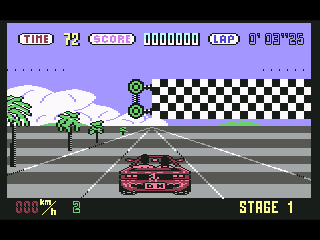 There is Time Attack mode which is basically a race against the clock on a pre-defined course and then there is Heart Attack mode which is quite similar to Outrun Race mode, but your girlfriend requests you to perform certain tasks to impress her and increase your score — such as knocking over as many of the cones on the road as you can without crashing. 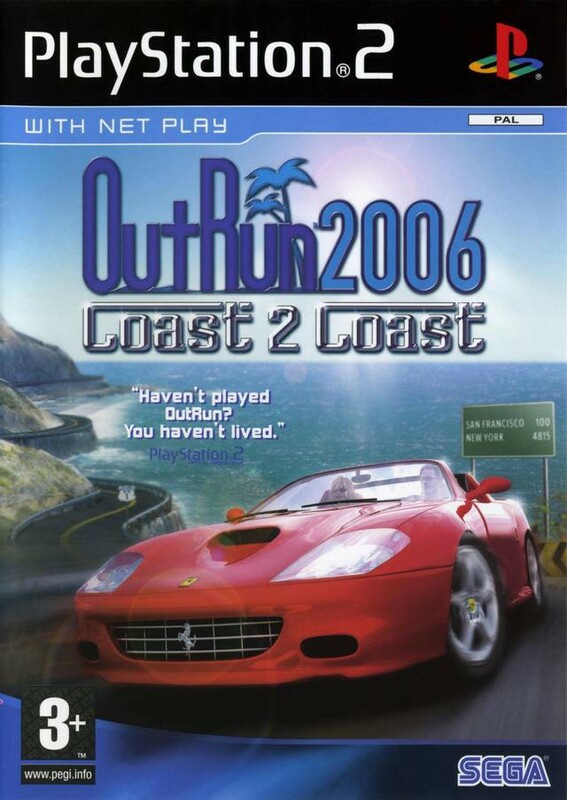 Outrun 2006 — Coast to Coast (known as Outrun 2 SP in the arcades) is an ‘upgraded’ version of Outrun 2 and was released together with Outrun 2 on the same disc in 2006 on PlayStation 2, PlayStation Portable and Xbox (and later on PC). This is the ultimate Outrun compilation and it includes many improvements on the already brilliant Outrun 2 including a slipstream feature where you can use the traffic to your advantage to drive faster due to less resistance. Adding 15 new additional stages and improving the graphics up to HD resolution and you are one happy Outrunner.